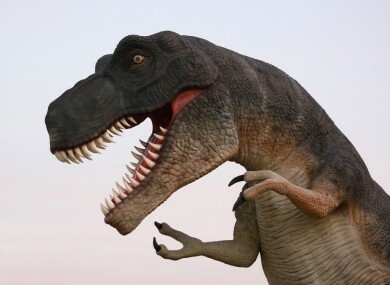 DINOSAURS MAY HAVE been neither cold-blooded like reptiles nor warm-blooded like mammals, but instead had a kind of lukewarm blood, researchers say. The discovery overturns what had long been held to be true about dinosaurs: they have traditionally been classified as reptiles and assumed to be cold-blooded (even the word ‘dinosaur’ comes from the Greek meaning ‘terrible lizard’). However scientists have discovered that their blood was instead a rare type which fell somewhere between hot and cold. Scientists published in the journal Science looked at the growth rates of hundreds of species, both living and extinct, and then examined the metabolic rate of the different species. Cold blooded animals are usually slow-moving and have less brain power, while mammals – such as humans – and birds can control their own body temperature at a safe constant, are quicker, and more brain power. The researchers found that feathered dinosaurs and primitive birds grew distinctly slower than their descendants, modern birds. But while dinosaurs didn’t grow as fast as modern birds or mammals, they did grow significantly faster than modern reptiles. “This higher energy use probably increased speed and performance,” said Grady. He said that dinosaurs were mesothermic, which he described as “thermally intermediate”. “Only a few species – such as great white sharks” are like that nowadays, he said. This may have helped dinosaurs to dominate their environment – and it probably also helped them to become enormous. “A lion the size of a T-Rex, while a frightening thought, would quickly starve to death because it would be so hard to find enough food,” said Felisa Smith, who also worked on the research. However by adopting a slightly more energetic strategy, the blood-type would have been the perfect solution. It allows a performance advantage over ectothermic reptiles but without the high overhead costs of modern birds and mammals. In any case, it was a successful formula for a long reign in the Mesozoic Era. Email “So it turns out that dinosaurs were neither warm nor cold blooded”. Feedback on “So it turns out that dinosaurs were neither warm nor cold blooded”.